The park is filled with rolling savannahs, palm groves, dense tropical forests and spectacular, sheer sided table-mountains known as tepuis, from which tumble cascades of water. Around 60% of the park is filled with over one hundred tepuis and geologists have calculated the sandstone rock to be millions of year’s old stretching back to a time when South America and Africa were part of a super-continent. 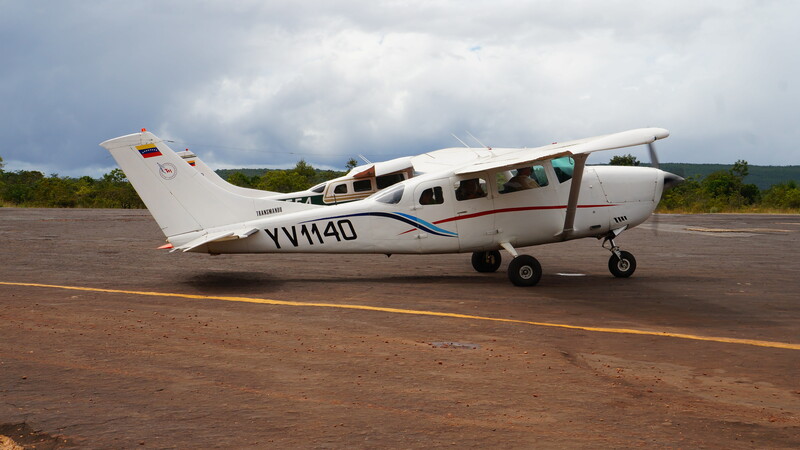 There is no direct road access to the village of Canaima so it’s necessary to take a light aircraft flight from Cuidad Bolivar or Caracas. Upon arriving at the tiny landing strip surrounded by jungle, you feel yourself instantly immersed in nature. Just a short stroll or boat ride from the village, there are endless enchanting and unusual photogenic landscapes guaranteed to put a smile on even the most jaded traveller’s faces. The park can be visited during any season with the dry months (January to May) bringing clear skies and the wetter months of August and September dramatically enhancing the flow of the area’s waterfalls. Overall, the annual temperature is a very comfortable 24.5° C. The sun is strong and there’s little wind so remember to pack a hat and sunscreen. By contrast, the temperatures on tepui summits can drop as low as 0° C during the night so, if you’re planning a trekking expedition, remember to pack accordingly. Canaima lies on a tranquil stretch of the Carrao River known as Canaima Lagoon. There is a gorgeous sandy beach at Caniama Lagoon, ideal for relaxing, and the water itself is red in colour due to the richness of minerals. When water levels are high, three distinctive palm trees make for some interesting photographs as they are partly submerged in the lagoon. 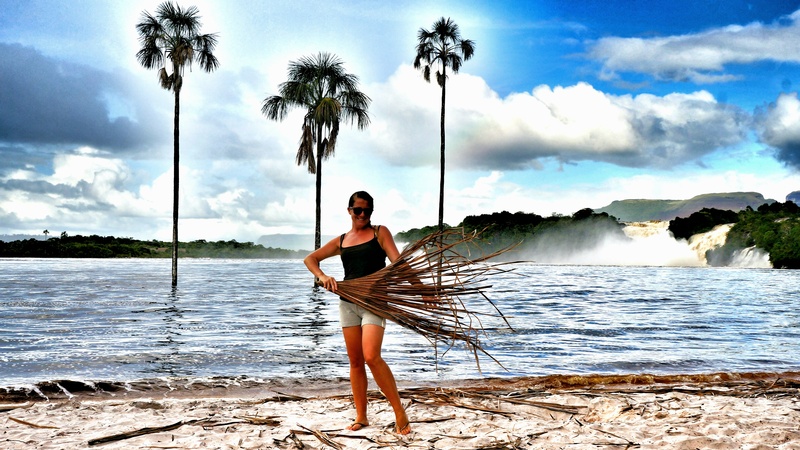 Most camps and pousadas in Canaima are run by tour agencies and are set around Caniama Lagoon. Some accommodation offers more luxury than others and most are basic but clean options with double en-suite rooms with ceiling fans. The majority of camps are traditional style thatched lodges. Communal dining on long wooden tables is great for socialising and offers travellers a real sense of community. 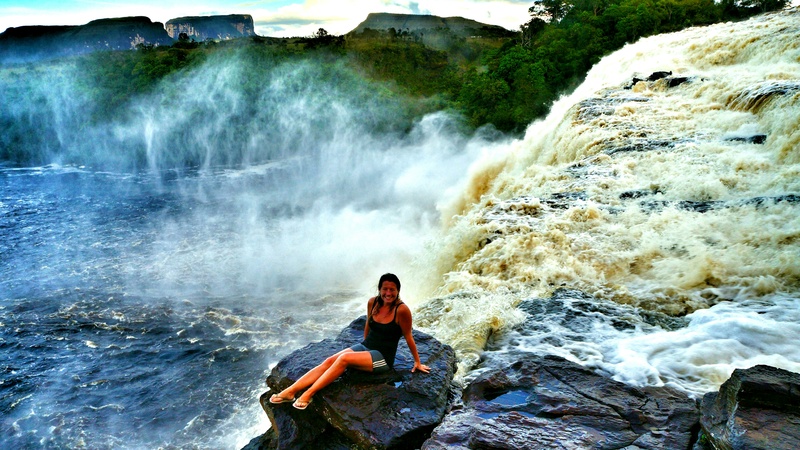 There are seven magnificent falls in close proximity to Canaima. 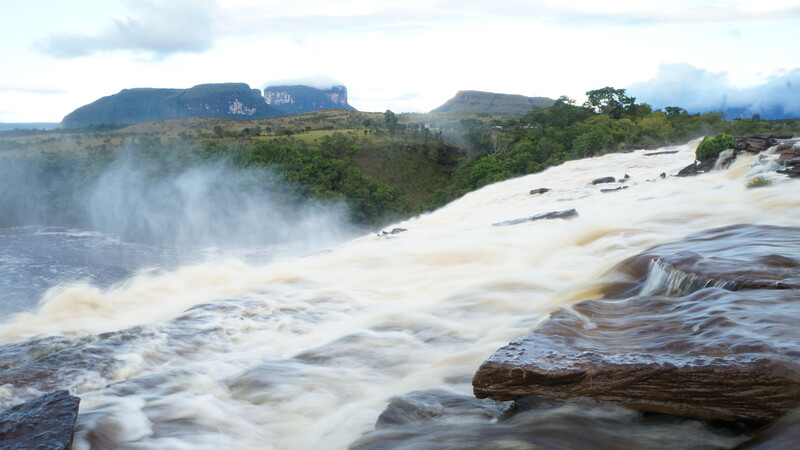 The cluster of powerfully wide waterfalls flowing into Canaima Lagoon from the Carrao River (El Río Carrao) consists of Salto Ucaima, Salto Golondrina, Salto Wadaima, and Salto Hacha. As you look at the falls from the lagoon’s sandy beach, Salto Ucaima is the closest to the village while the furthest away and probably the most attractive is Salto Hacha. There had been some heavy rainfall in the weeks before we arrived so Salto Hacha was an impressively wide roaring torrent. 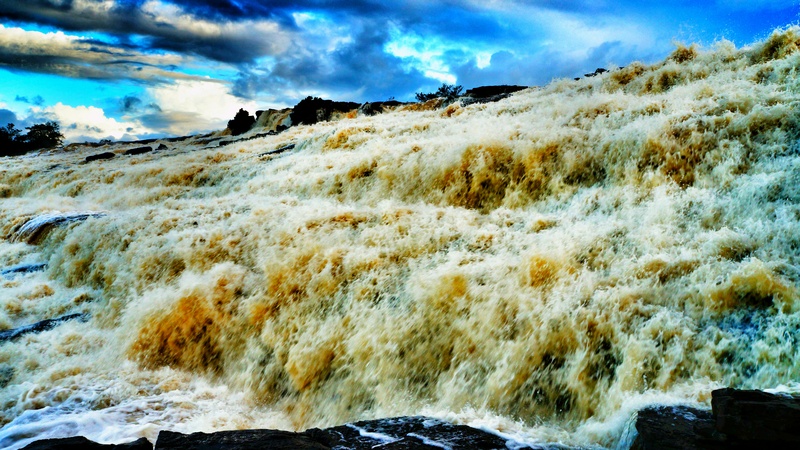 There is a lookout (mirador) right on top of the falls where you can appreciate the sheer power of nature the water froths, bubbles and then plummets suddenly over the edge. To find the lookout follow the road from the lagoon and walk out past the village to where wooden walkways have been constructed over the falls. 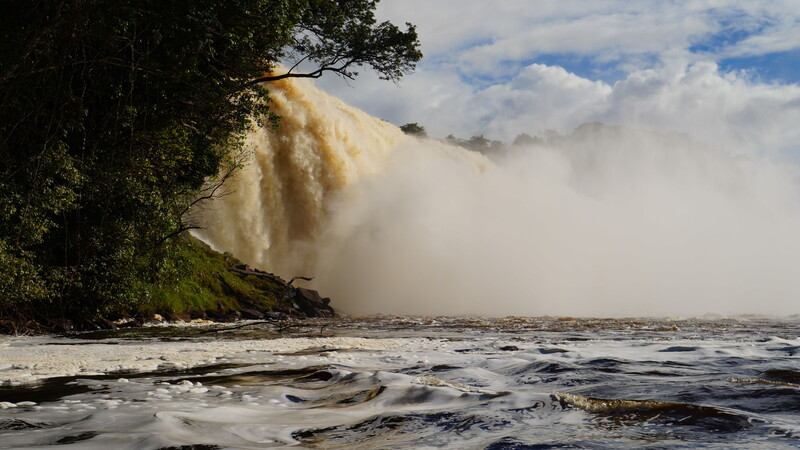 To get the full frontal views of the falls, part of your tour will include a motorised boat trip out into the centre of Canaima Lagoon and then closer and closer to the falls until the spray satisfyingly drenches everyone on board. 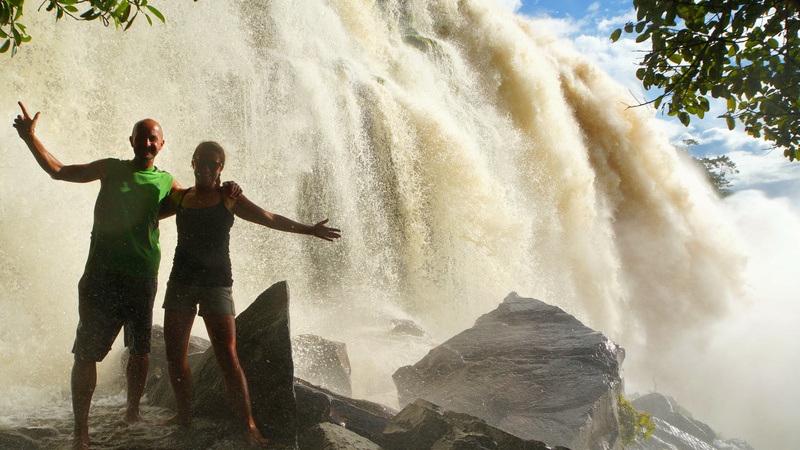 A boat ride across Canaima Lagoon and a short scramble across a rocky path will bring you out at a smaller and more secluded lagoon where Sapo and Sapito Falls can be found. Sapo Falls is very special as it’s possible to walk directly behind the falls from one side to the other. Swim wear and a plastic bag for your camera are advisable as not a dry patch will be left on your person but the experience is well worth it. The plateaus and rock types found in the park are similar to Monument Valley in Arizona but in comparison to the dry, desert landscape, Canaima is filled with lush tropical forests and thundering waterfalls. The tepuis are very much the stars of the show here and these ‘floating islands’ were the inspiration for Sir Arthur Conan Doyle’s 1912 novel, “The Lost World” in which dinosaurs, prehistoric plants and ape men still lived. 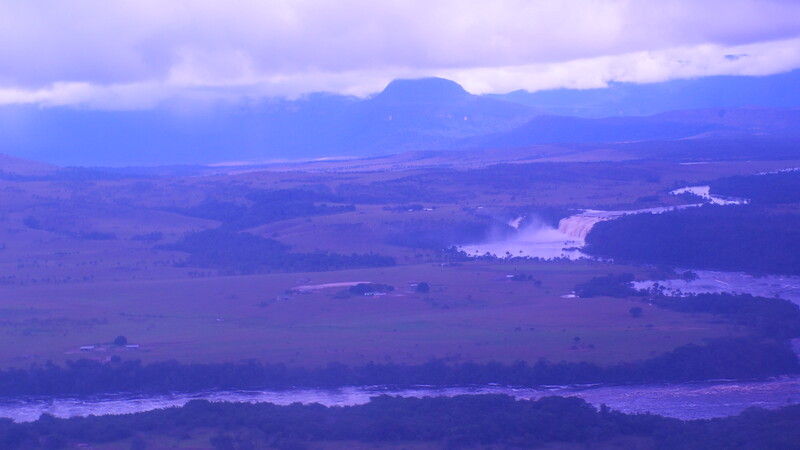 Sadly, none have been spotted to date, but due to their inaccessibility, the tepuis offer a unique biological and geological environment with many endemic plants and animals. 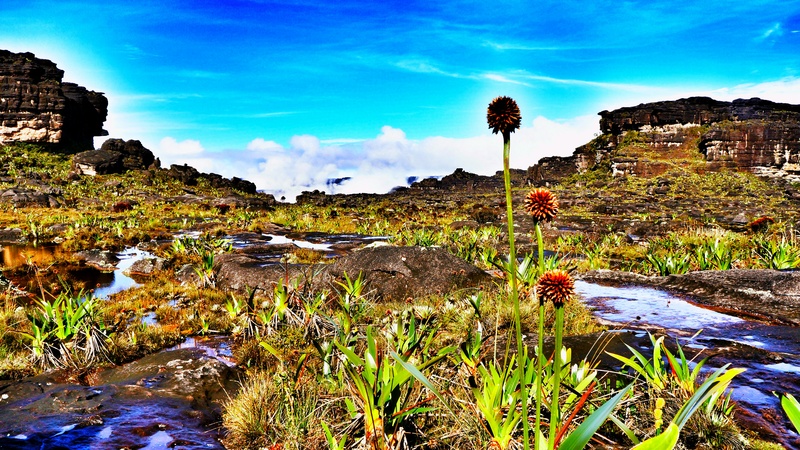 Roughly half of the plant species found on top of the tepuis and some small animals are completely unique to specific mountains. There is an incredible variety of wildlife in the area, including monkeys, poison arrow frogs and tropical birds. Mammals are generally difficult to spot but include giant anteaters, armadillos, porcupines, three-toed sloths, otters, jaguars, pumas, tapirs and capybaras. The park is home to indigenous Pemon Indians. The remote region is very sparsely populated with around 15,000 indigenous people living in nearly 300 dispersed villages. There are only a few dusty roads connecting settlements and most transport within the park is done by light plane, by canoe or by foot. 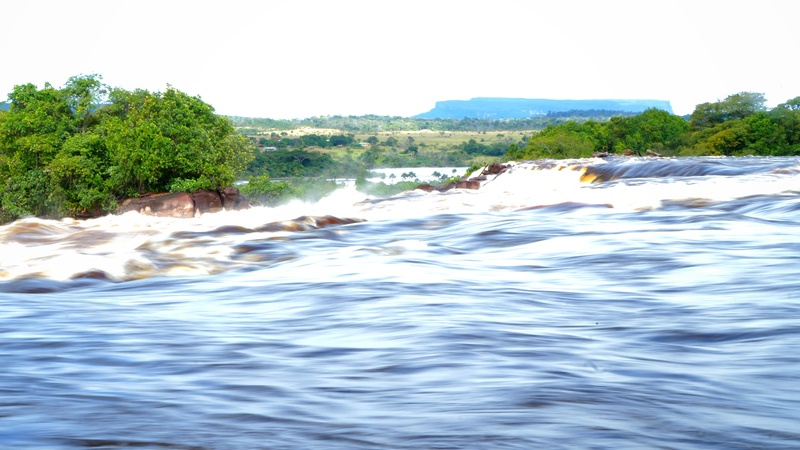 The Pemon have great respect for nature and the tepuis, believing they are home to the ‘Mawari’ spirits. 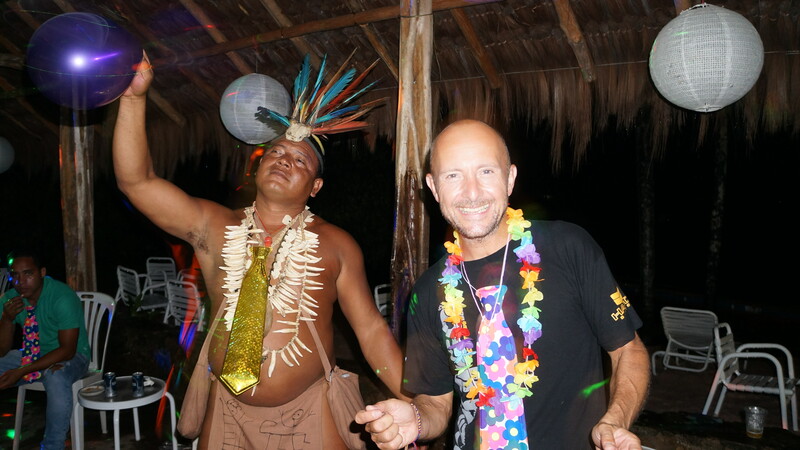 The Pemon Indians now have access to electricity, schools and basic medical care but Canaima still offers a very simple and rustic way of life which will appeal to many people. As soon as the light aircraft lands on the tiny airstrip your shoulders relax and your walking pace will slow to a saunter. Despite being touristy, the locals aren’t jaded and are endlessly friendly towards the constant stream of international visitors. Locals have been able to benefit from tourism in Canaima village by opening small shops selling basic provisions, or rustic cafes and bars. One of the international members of our group was celebrating her birthday whilst we stayed in the park and we got to enjoy an evening of music and dancing with some locals. The man they called “The Chief” was a good sport, proudly dressed in traditional clothing, he amusingly danced with us to modern day pop tunes! He’s the one on the left by the way! 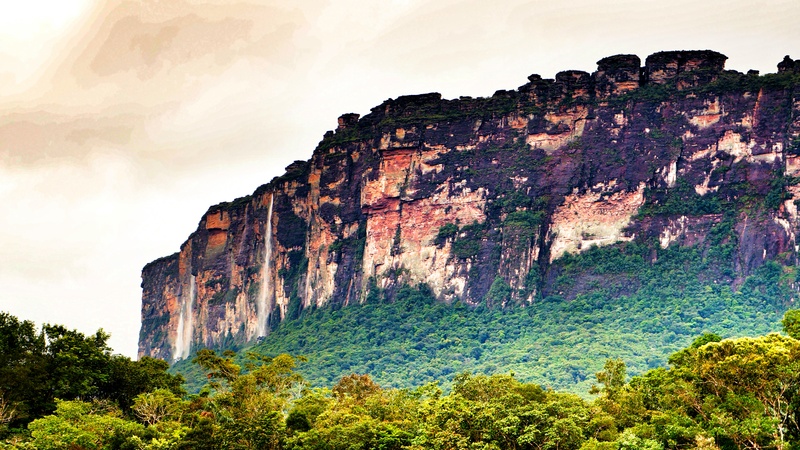 Despite the number of tourists who visit the park to see Angel Falls, many don’t realise that so many other attractions exist in the Park and feel like they’ve stumbled across a well-kept secret slice of paradise. A trip to Canaima National Park is nearly always arranged through a package tour due to the isolation of the area and limited facilities. 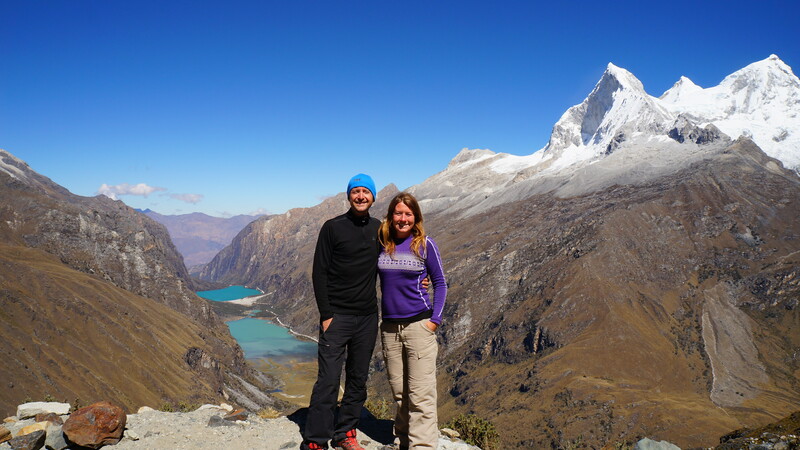 Group travel also means cost sharing and makes the trip much more affordable. We paid $100 per person with the excellent black market rate for USD but prices can vary so shop around and barter hard. 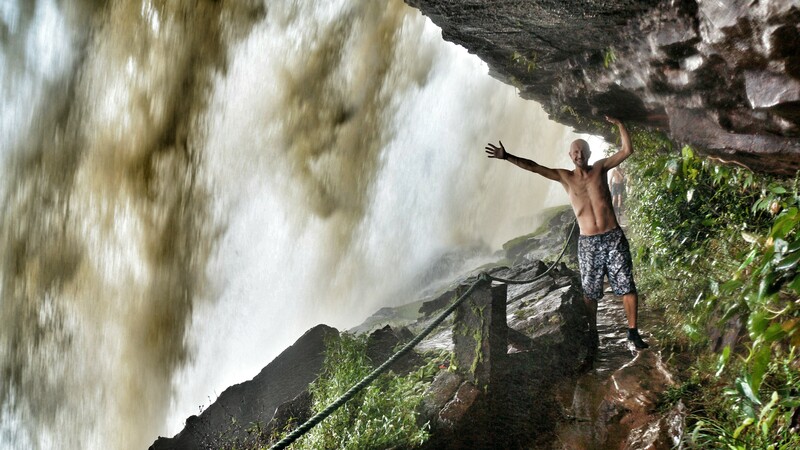 Most tours offer one night at Angel Falls and one night in Canaima village exploring the local area. The best place to arrange tours is Cuidad Bolívar, considered the gateway city to the park.